An article from our http://www. retaining walls in the front (done in landscape) where the site may have been cut. When building on a down slope block it is a good idea to try and have the garage and front entry on a similar plane. Down slope blocks usually require less excavation that an up slope block. This tends to reduce the size and number of retaining walls. Down slope blocks are easier to step in line with the contour of the land and lend themselves well to split level design. With a split level design the taller ceilings will be to the rear of the home and the lower ones to the front before the split level. With higher ceilings you will find that the living areas will feel light and airy and feel much larger than they actually are. Always try and keep the ceiling heights at no more than 3 meters high to avoid excessive labour and material costs. Also consider that heating and cooling gets harder as the ceilings get higher. With a down slope block you will find that there is more and more air space under the floor as the block falls away. By the time you reach the rear of the home there is usually sufficient height under the floor to create another habitable space. This space is referred to as a basement floor. Unlike an up slope block the basement is not created by excessive excavation, and sometimes is not under ground at all. By using the natural fall of the land the basement floor can be built with a relatively small amount of earthworks and retaining walls. 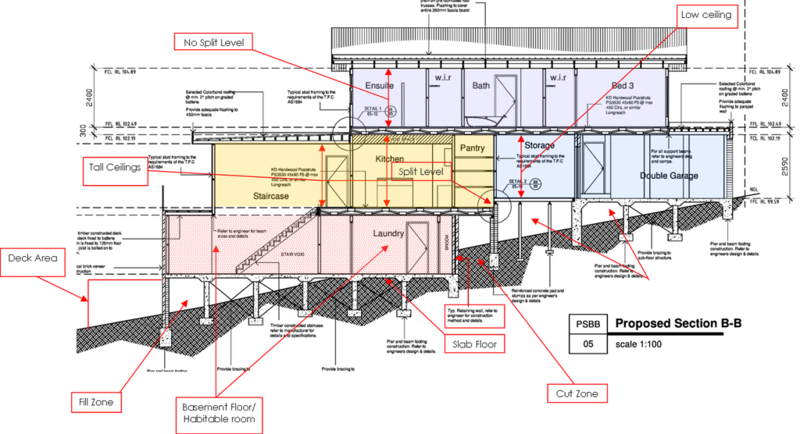 The illustration below shows how the spilt level and basement will work in a down slope home and how it uses the slope of the land to achieve this. A basement can be quite large and add considerable floor area to the home, which translates to more material, labour and construction costs. However if you decide not to build the basement to save money, be aware that you would still need to construct the sub floor, brick footings and foundations which make up a significant portion of the cost. Therefore converting what would otherwise be under floor storage to habitable space does make sense. There can be some challenges to achieving the required 6 star energy rating when building on a down slope block. This is caused by the use of a sub floor as opposed to a slab. You may need to increase the insulation and use double glazed windows due to the loss of the insulating properties of a slab. Visually the rear of the home will be quite imposing as it will be as high as 3 levels depending on the type of home you design. There is a great opportunity for the living rooms to be designed to take in surrounding views. 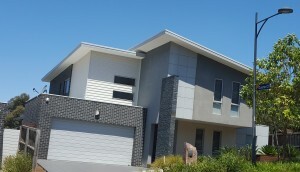 Although it can be more expensive building on a down slope block, with good design the costs can be reduced to make your home more affordable.